They way they have talked makes me think if anymore gates open then they will reopen it to C.
Any timeline on when they want them open? I would guess summer 2020? Hopefully they use some of the vacant storage or whatever it is space to put in some sort of food. I would think sooner rather than later but who knows? I know that MDW is beyond maxed out and STL is envisioned to be an East/West scissor (Hub). I think the general consensus was possibly by the end of the year, but probably no later than 2020. Since they're already announced an expansion of the T2 baggage claim I can't see WN using T1 baggage for arriving flights. Isn't the airport also working on a renovated/enlarged Customs area to handle more flights? It would also be interesting if WN could eventually have some sort of checkin in T1, but that would make things complicated in terms of baggage handling. I don't know how much space is in the alley way between C-D, but it would be interesting if some of the gate areas in D could be built out/expanded to make more space. I like how ATL renovated T/A/B and raised the drop ceiling and modernized their dated concourses. I could see something similar to D. I'm sure the airport would also love to fill some of that vacant retail space in D.
I booked one of those for next week, DEN-LHR on the 744, $480 RT/ticket. I've paid more to fly PHX-STL in the past. The problem with D is that it's not very wide. I flew out of there a few times when AA was there after the tornado. My recollection is they had the AA club in the space where Cheers used to be, which wasn't very big, and then further on down the concourse they had a small bar. Yeah it is NOT wide at all. You can see it in the photo below at D20&22 which would limit what can go in there. But surely they could figure something out. Well keep in mind "back in the day" these gates served 150 passenger aircraft without any problem. They function as gates just fine. The problem is, there's no space for retail or restaurants. There is a little bit of space.... somewhere in the middle of D there was a bar/lounge/small restaurant and another little fast foodish type of place. I don’t remember any retail establishment though. I’ll say this, it’s already a hike down to E34-40 when coming in through security at T2. Could WN reopen E2? Was that closed because of spacing issues? They could push back the Super Park lot, couldn't they? The last thing they need to do is remove parking for T2. I think they should be building a garage on that lot. In the Ozark days it was accommodating DC9's, but then TWA used it for 727's as well. There are plenty of tight concourses. As someone who goes through ATL 15-20 times a year, and someone who is based at DCA there are tight gate areas everywhere. (Don't get me started about the mess that's DCA) If D really comes back it would be interesting to see if they "bump out" any areas to create larger spaces for retail/restaurants. The concourse would also look much different once it gets the "white" update/treatments that the rest of the airport has seen. I'm in/out of A a few times a year and it looks pretty good. Absolutely! It was a nice effort but why it wasn't built into a garage, I don't understand that one.... The Terminal 2 parking experience can be quite the cluster! To be fair, they weren't really 150 massager jets back then. TWA's MD-80s had around 140 seats and so many of the flights were on DC-9s with as few as 76 seats (in the case of the old DC-9-10/15s). Plus its back in the day of airlines pricing and flying planes at 70 to 80% loads. In an7 era of slimline seats and packed planes, the smaller gate areas on the D concourse probably are going to be packed for a fully loaded 737. The idea of bumping out the skinnier section to match the rest of the concourse was something I never thought about. Not a bad idea, just not sure on how much it would cost. But that would add enough space for retail/restaurants. Might be a long skinny one but it would be doable. Or for fast food. Still seems like they should be able to make a food court with this area. Agreed. I don’t even know if they’d have to bump out the entire thing. Even a section or two to add additional space would help. I travel mostly out of A and there’s quite a bit of food/retail for such a tight concourse. Funny, 20 years ago I was rarely in A and now that’s all I use. And Jshank83 thanks for keeping things updated. I like reading your updates. While I am posting floorplans with C29/30 opening up soon here is what is left of C. I think the wall going in now will be just to the left/west of C31. Question - I forget this but is the Terminal 1 building a designated landmark? Yeah, I'd think of it as something you'd promote for people who don't have checked bags. Tell me about it! I recently flew DCA-STL out of 35X. I felt like I was on a forgotten flight. Also, the CRJ200 I was on was missing the outer armrest and another seat had a missing seat back! I took many an `80 in and out of the D concourse. I'd be willing to wager if you opened up STL's D concourse as it is now you'd find there is more room there than at the current LGA. And there's definitely more room in the D concourse than there is at KEF, where Ice Air is bringing in 757s. Now, that being said, the whole D concourse would need a re-think. It needs light, it needs fresh air, and could probably use some more room, get some windows in there and let it be ...vibrant, rather than a dark cavern. And in this day and age, what matters most is how you're able to squeeze in as much retail concessionaires paying rent and a profit percentage. I don't remember a plethora of places to grab a bite in the old days. Would it be possible/feasible to add a third floor (or a floor above the current gate level) to D to give enough room for restaurants/bars/waiting areas ? It seems that would minimize some of the need to expand the concourse out into the ramp area between C and D/E. The last few times I have flown on Southwest (arriving and departing), I have gone to gate 34 and there is barely room for a couple kiosk-style stores and insufficient seating area, much less a full-service restaurant or bar. 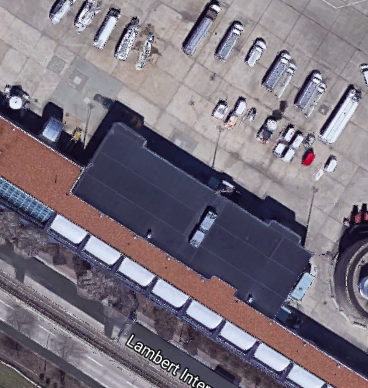 On a technical level, it might be possible, as the whole concourse was designed and built strong enough to accommodate a people mover on the roof that never came to fruition. It probably wouldn't be possible on a feasibility level though - just too expensive to justify the cost (plus who know if it would meet codes or what have you). Be tough to squeeze in stairs, too - though that could possibly be mitigated some by connecting such a hypothetical level to the existing 2nd (passenger) level for Concourse C where the Metrolink station connects to the terminal. If anyone would like a copy of the airport's "Leased Premises" document (where Jshank is getting the floorplan screenshots from), I have a copy here, as the original is no longer accessible. I think fo D the least expensive way to add additional retail (rentable sq’) is just bumping out sections between the gates. It wouldn’t take much. The airport could justify because it would be rented out. Another option is build a bigger food court/retail area where C/D meet and take over some of that apron area. As for brightening things up, if you haven’t seen what ATL has done with their Delta concourses it’s worth a look. They were dark and had low ceilings and they significantly brightened things up. The work is now done. I’m always on Delta and their gates 19/21 are about 10’ apart in the corner. They use those gates for their A321’s to ATL and 757 to LAX. Often there’s two large planes there at each gate. It’s jammed. I wonder what the long term plans for STL/BNA are. Nobody really knows. I've heard rumblings that WN wants to turn Nashville into a slightly smaller version of BWI, and is playing a big part in BNA's current expansion. I wonder if they'll cut ATL to O&D basics. Even more so, what the long term plans for the Southwest network, as a whole, especially during the next 10 years. There's only so much more they can do in terms of connecting points within the current network before becoming stagnant. Obviously Hawaii will be a big game changer but I'm thinking in terms of Fresno, Sarasota, Green Bay, etc. etc. What is your trust level in your sources. I know I have heard pilots and FA are the last to know anything but I don't know about ground ops. WN will be operating fewer daily departures out of MDW in Summer 2019 than in Summer 2017 since WN will only be operating 251 daily departures out of MDW in Summer 2019 compared to 265 daily departures out of MDW in Summer 2017. WN does have room to add more flights out of its existing gates at STL since WN currently uses 17 gates at STL and since WN will only be doing 121 daily departures out of STL in Summer 2019. WN can likely expand STL to at least 170 daily departures without reopening additional gates at STL. WN also already does more departures per gate per day at some other WN stations such as AUS, DAL, LAX, and SJC than it currently does out of STL. Definitely not high level. Just talking to the local Operations Agents while passing through STL a couple of days ago. We came into E38 so I was just talking to the agent about what they were hearing locally. In other words, don’t get your hopes up, but they told me the same information prior to the official announcement of the current reopening of the former D gates, so, their information is usually pretty good. No official timeline given though. Sorry. I wouldn't discredit what's being discussed as being too far out into left field. It's no secret that MDW is pretty maxed out. Southwest is probably being smart in not pushing too much for expansion possibilities and opportunities as leeway and concessions for other carriers may have to be made. As/if this continues, it wouldn't be too far fetched to see Southwest try and focus Chicago as much on O/D traffic as they can and move connecting flows to other cities such as STL/BNA. It is 122 mon-fri and 127 on Sunday. It depends how WN banks the flights. If they want 18 flights in some banks then they need more gates. They aren't spread out evenly throughout the day. They run less than 10 banks and they aren't gate constrained like at some of the airports you list. DAL/LAX/AUS they can't get more gates at the moment so they have to make it work with less. I am sure they would like more flexibility if they could have it. At STL they can add more gates so then they can run the banks how they want and don't have to cram flights in. I am sure we will see a post on the city website asking for construction bids at some point before it is "announced" so that will be a clue. We probably can form a timeline after that. Thanks for the info. The same concept should be applied to ATL. I don't have the numbers, but there are frequency reductions, and MSP and DTW lost their WN ATL flights for increased BNA frequencies. In addition to dropping ATL-DTW and ATL-MSP nonstop service, WN has also reduced frequencies on ATL-BOS, ATL-MKE, and ATL-PHL nonstop service. So I remember years ago reading on A.net doubts that WN would hit 100 daily departures. Look at where things are now. If they add 3-4 more gates they could easily hit 140-150. STL easily has the space for WN to expand and do whatever they want. We already know th airport is working to expand T2 baggage claim and the FIS facility. It will be interesting to see what happens. I’m also surprised NK and/or B6 haven’t shown any interest in STL. WN make take that as a good sign. Side note, has anyone heard if BLV is actually going to expand their terminal? I find it amazing that airport suddenly has a need to grow. I think it has been approved but they don't have the funding yet. I emailed them a couple months ago. This was one question and answer. Is there any concern that you are doing a major expansion on the airport when you only have one airline. If the money is spent then Allegiant goes under, is bought out, or leaves then we are left with an empty airport. I am all for expansion if it is warranted but I would hate to see all this money spent then we have nothing to show for it. Are there any assurances from Allegiant that this is needed or other airlines that could show up to fly from the airport? Unless Allegiant adds a fair amount of new flights (or hopefully a base) I would think they should be able to get by with the current setup. I would just like to know more about the thoughts that went into forecasting that this is needed. I think the airport has done a great job recently, I just want to make sure we don't get ahead of ourselves. The passenger terminal is operating at or above capacity during the peak hour. The original facility was designed as a 4-gate operation of which two are ground level walkout gates and two are served by passenger boarding bridges. Post 9/11 security concerns and ADA issues effectively eliminated the walkout boarding opportunities as stairs and lack of secure waiting space make these two gates unpractical. This, in addition to the Airport experiencing 2-3 flights during the peak hour and the continued growth forecasted, has necessitated a plan to right-size the terminal. The current layout precludes additional airline service. Allegiant has demonstrated the need for passenger service at MidAmerica St. Louis Airport. Airlines with similar business plans exist in today’s marketplace. It is anticipated that additional carriers could come to BLV. All that $ for one hour and a somewhat carrot for the future. Any chance Allegiant could move to the main airport and leave BLV? It’s someone odd to have two airports serving the metro area, even if BLV is only one airline, when STL has plenty of space. I understand the idea behind BLV back in the TWA days. It is interesting to see Allegiant do well there. If Allegiant had the space to expand a bit they could easily hit 400-500k annual passengers, which is crazy sounding. They like being in secondary airports so I doubt it. Guessing mid America is giving them a good deal also. They have found a nice niche over there. They like using the main airport as leverage to get what they want at the secondary, too. Same deal here in PHX though. Sky Harbor has plenty of space, but they choose to remain at IWA, which is in the far southeastern corner of the metro valley. They make it work though and people come from all over the area to fly them. Happy to see Allegiant doing well at Belleville and happy to see the flights at Mid-America. That being said, hilarious there are concerns about a "traffic jam" at the airport when it's the same airline doing the scheduling. I know every city in the Allegiant system can't be a base for flight attendants and pilots, but if Bellevegas keeps going, you'd think we'd be getting close to that point of major consideration for them. I’m also surprised NK and/or B6 haven’t shown any interest in STL. WN make take that as a good sign. Speaking of B6 (which I don't see STL on their radar) I DO see "Moxy" coming here (STL or BLV) whenever they launch. David Neeleman, in a recent interview with Traveler (Conde Nast) didn't say anything about routes for obvious reasons, but there was a question that included STL With that order of 60 A220 it should be interesting. "What about the airports that lost out in the merger and consolidation wave, like Cleveland, Memphis, St. Louis—is that the kind of opportunity"
I think B6 would do well on BOS, FLL and MCO, maybe a seasonal SJU if they want to think outside the box. Especially with the new A220. With that said, I think they are trying to fix a few things and I don't know if they have more midwest expansion on their mind at this time. Moxy sounds like it's going to be interesting, but I don't know if I see them launching STL when they start. Who knows.